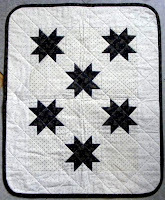 Quilting Adventures: Clubs, clubs and more clubs... Sew much fun...! Some of you might know that I have been running a number of clubs at Fibre Junction. Allow me to share with you a new one I have started that is called Prairie Women Sewing Club, designed by Pam Buda of Heartspun Quilts. The first Journey was conducted in the summer and actually done in French. What a blast it was! The pattern for Gathering 1 is called Leap of Faith. The key concept of this club is the "make-do" mentality, which is not as easy as one thinks. In a disposable easily accessible world, "make-do" has become quite foreign to many, including myself. It is much easier to run to the quilt shop and buy more fabric than it is to look for something else that would work. 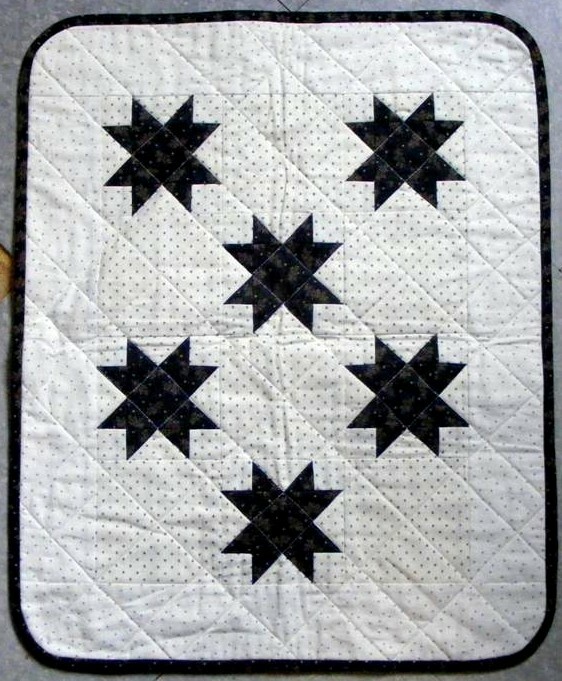 This quilt offered my first opportunity to "make-do". I ran out of the background fabric! Off I ran to Fibre Junction to purchase more, only to find that the bolt was sold out!!!! WHAT?????? I seriously thought of making another top by buying using a different fabric.... but... that would be cheating. Right??? The background on the outer edge is actually a fabric I bought back in 1996. It was a remnant from the sampler quilt that is responsible for this obsession hobby of mine! lol You may read all about here. If anyone of you are interested in doing a "web" based Prairie Women Sewing Circle, send me an e-mail and we can chat about it. I would be happy to open a group where we can chat and share our projects. It is such a great idea. I am sure that our stashes are so much better than the women of the Prairie, but it sounds like fun. I love to make do, easier than thinking or looking for the perfect fabric, lol. I love how it came out and love the look of quilts with replacement fabrics. I can read and write french better than speaking, and now I can understand the basics, but you lose it when you don't use it. I don't know you, but stumbled onto your blog. I think the online club is a nice idea and would love to be part of it. I don't know how to email you, though.